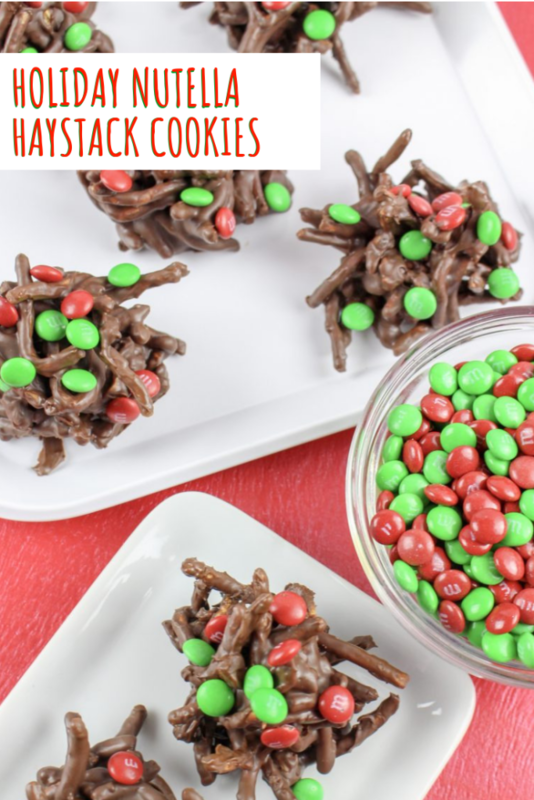 Holiday Nutella haystack cookies make the perfect sweet and slightly salty cookie this season. 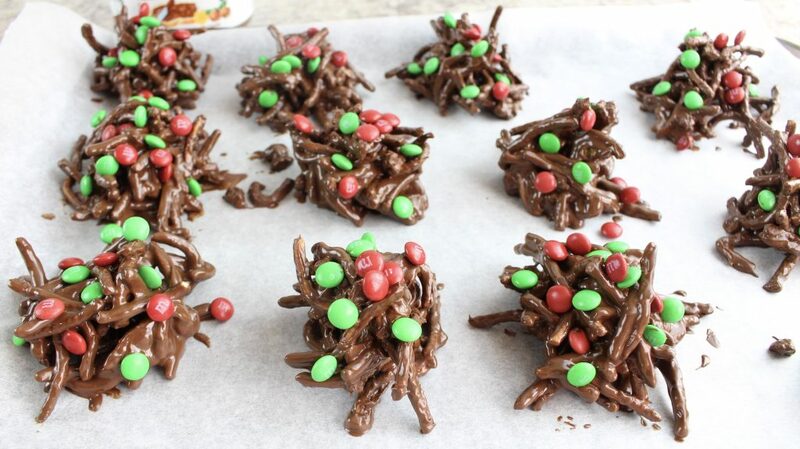 You don’t have to fuss with the oven in order to enjoy these festive no bake cookies. My oven gets a workout this time of year. Does yours? Sometimes I feel kind of bad for it. I get so demanding, making all sorts of extra goodies. And now that cookie season is practically upon us… well good luck oven. But my sympathy for my oven’s workload this time of year doesn’t mean I won’t make all the goodies. My family would definitely be disappointed if I cut back on my treat making. 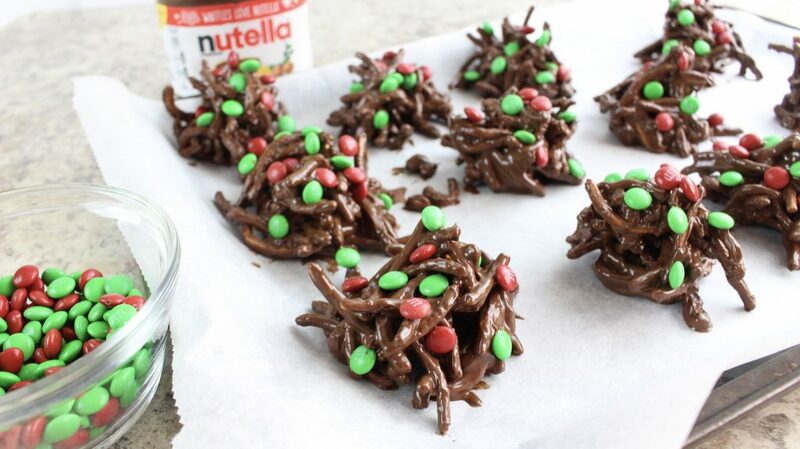 So instead of cutting back, I throw some no bake drop cookies into the mix like these holiday Nutella haystacks. Let me tell you, my oven isn’t the only one that appreciates these no bake cookies. My entire family can’t get enough of them. They are just so yummy with all their chocolatey goodness, a bit of crunch and a little hint of saltiness. It’s that perfect combination of salty sweet that is just so addicting. So what makes them so addicting? Well, first, obviously the Nutella. The last time I went to Costco, I stocked up because who doesn’t need all the Nutella? Drool! It’s one thing my whole house agrees is necessary to life. Then after the Nutella, I really up the chocolate factor with melted chocolate chips and M&M’s. Because there’s always room in life- and in cookies- for more chocolate. The holiday M&M’s serve a dual purpose here. Not only do they up the chocolate quotient, which is very important, but they also pretty much are the festive factor. 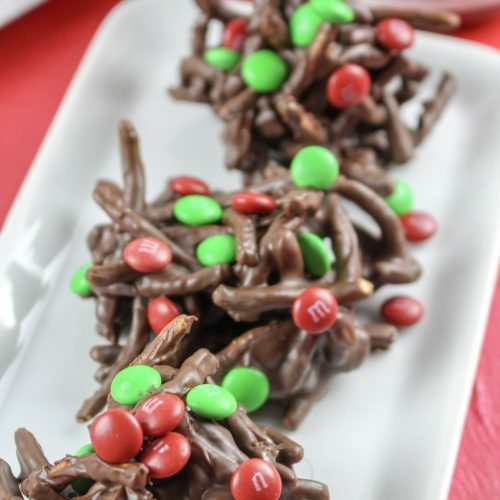 You can make these holiday Nutella haystack cookies any time of year, but switching from plain M&M’s to holiday M&M’s really dresses them up for the Christmas season. So, now we’ve upped the chocolate factor, but I personally love the hint of hazelnut from the Nutella. I wanted to bring that out more so I added some chopped hazelnuts to these cookies. The hazelnuts add a little extra flavor and bring out the crunch from the chow mein noodles, which is where that perfect hint of saltiness comes from. So you’ve got easy ingredients that are all delicious all on their own but are even better all together. Now, let’s look at how easy these cookies are to actually make. There’s no mixer, no preheating, no greasing cookie sheets. 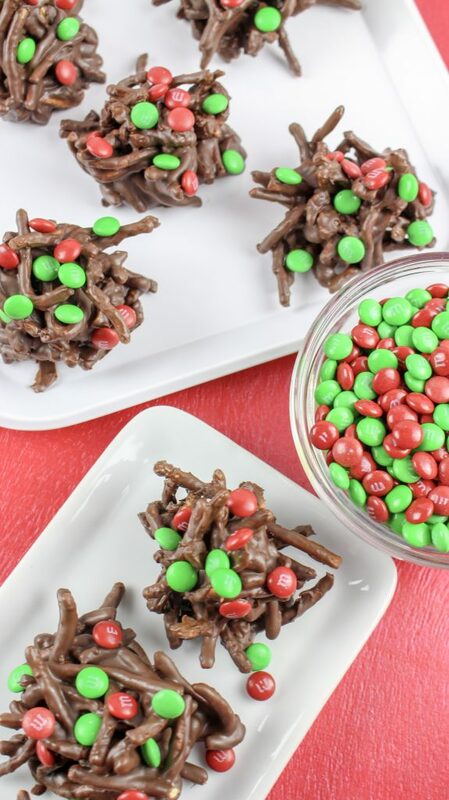 They practically make themselves, really, so these holiday Nutella haystacks would be just the thing to bring to that holiday bake sale or your kid’s school party. All you do, is pour the can of chow mein into a bowl and set it aside. Meanwhile, melt the chocolate chips over a double boiler. This is the most time consuming part and it is not that bad. To make the double boiler, just set a heat proof bowl filled with the chocolate chips inside of a pot with a few inches of simmering water. Stir regularly until the chips are melted and then take the melted chocolate off the heat. Then stir in the Nutella and try not to lick the spoon. It’ll be hard. The hardest part of this recipe to be honest. 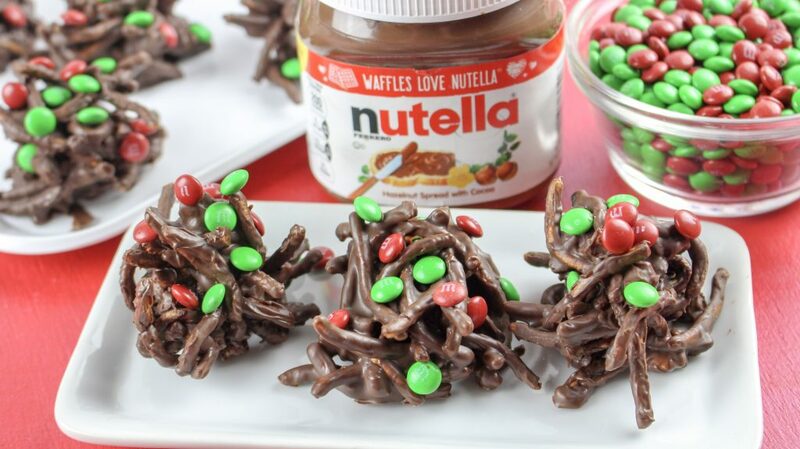 Because, believe it or not, you are almost done making these holiday Nutella haystacks. All that’s left? Pouring the chocolatey mixture onto the chow mein noodles and tossing with the hazelnuts. When the mixture is all combined, just spoon it out onto a cookie sheet lined with wax paper. Then before the chocolate mix hardens, decorate each cookie with M&M’s. Last, let the chocolate set and then enjoy! 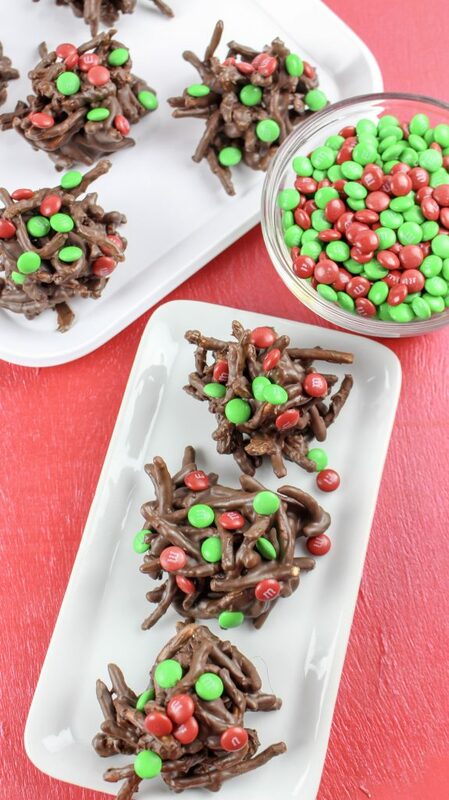 Quick, easy cookies- these feature the perfect blend of sweet and salty, with yummy chocolate on chocolate plus Nutella stirred into crisp chow mein noodles. Pour the chow mein noodles into a large mixing bowl and set aside. Add the chocolate chips to a double boiler pan and melt over medium heat, stirring occasionally. Remove from heat. Add the Nutella spread and stir to combine. Pour on top of the noodles and gently toss to coat. Add the hazelnuts and toss to distribute. Line a cookie sheet with wax or parchment paper. Drop the haystacks by the tablespoon on the lined sheet. 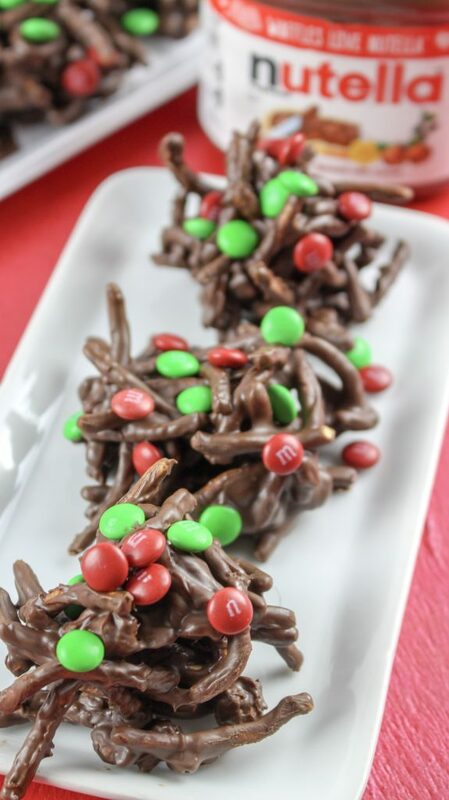 Before the chocolate hardens, sprinkle each haystack with red and green M&M candies. I used mini M&M’s but regular size candies would work too. Place in the refrigerator for about an hour to allow the chocolate to completely harden. ENJOY!! Store in an airtight container in the refrigerator for up to 30 days. Chow mein noodles – I haven’t eaten those in a long time. Looks like a quick and chocolaty treat for everyone, especially kids. Thanks for bringing these to Fiesta Friday.